Lucky you! April Fool’s Day isn’t until tomorrow, so we will not prank you. After all, we wouldn’t want to be one of those awkwardly early pranksters… Yeah. This completely serious blog post was inspired by MEE. Bun Mee, that is. Opening Friday in San Francisco, this Vietnamese street food restaurant is stirring up a lot of buzz from popular sources like Thrillist and Daily Candy. 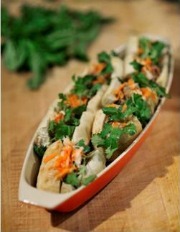 With nine banh mi variations in the works, what’s not to be excited about? In case you want to try making your own, Parties That Cook has your recipe for delicious Banh Mi Sandwiches, complete with tangy Pickled Vegetables and the spicy kick of Hot Chili Mayo! 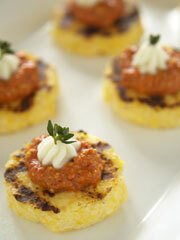 This recipe can also be found in our Appetizer Recipe Library. Prepare Vegetables: Place the carrots, daikon, rice vinegar, sugar and salt into a small bowl and let sit for ½ hour up to 1 hour. Stir occasionally. Make Mayo: Stir mayo, green onions, Sriracha and salt together in a small bowl. Set aside. Make Meatballs: Preheat oven to 300°F. In a large bowl, gently mix pork, basil, garlic, green onions, fish sauce, Sriracha, sugar, cornstarch, salt and pepper. Using moistened hands or a small scoop, roll meat mixture into 1 ½-inch meatballs. Arrange on baking sheet. Cook Meatballs: Heat sesame oil and canola oil in large skillet over medium-high heat. Add half of the meatballs. Sear meatballs until brown all over. Lower the heat if browning too quickly, about 5 minutes. Transfer meatballs to another sheet pan. Repeat with remaining meatballs. Then place into oven to finish cooking for 7-8 minutes, until cooked through. Assemble Sandwiches: Cut each baguette into 8 mini baguettes. Then cut each mini baguette 2/3rd the way through (leaving one side attached). Pull out enough bread from each mini baguette to leave 1/4-inch-thick shell. Spread hot chili mayo over each bread shell. Cut a meatball in half and place in a mini baguette. In the middle of the meatball, place cilantro and mint, pickled carrot and Daikon, and finish with a sprig of cilantro. Arrange red jalapeños on top. Secure with a toothpick. Serve: Garnish tray by making sure the cilantro and vegetables are poking out showing off all of the beautiful colors. For other Vietnamese food options, Thrillist has rolled out a Bay Area Banh Mi Map. You should also check out Kitchen Side Car and Little Knock – the forces behind tonight’s Rice Paper Scissors, a Saigon-style pop-up open from 6pm until they’re sold out! Follow @kitchensidecar and @littleknock for the exact location.